Rev. Terri McLellan was elected Sunday, November 12 to serve as the pastor of Shepherd Park Christian Church (SPCC). She is the second African-American to hold this post and the first woman to lead the congregation in its 118 year history. The installation service was held Saturday January 20, 2018 at 2pm. Rev. Terri is an ordained minister with the Christian Church (Disciples of Christ) Capital Area Region. She served as an elder and the chairperson of the Christian Education Department at SPCC. Her areas of oversight include Youth and Adult Sunday School, Small Group/ Discipleship classes, Vacation Bible School, Church School, Leadership Development, and Disciples Camp & Conference Activities, as well the spiritual and faith-formation for the SPCC church family. Rev. Terri’s passion is in the area of Organizational Transformation and Leadership Development. 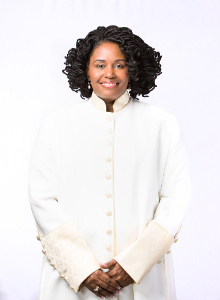 Her theological training includes a certificate of Biblical Studies from Calvary Bible Institute @ Greater Mount Calvary in Washington, DC; and a Master of Divinity in Practical Theology from Regent University in Virginia Beach, VA.
Rev. McLellan’s call to the Shepherd Park family follows the 17-year tenure of Rev. Marcus Leathers, who was the first African-American to lead the SPCC congregation upon his election in 1999.